Founded on March 16, 1827 as a four-page, four-column standard-sized weekly, Freedom's Journal was the first black-owned and operated newspaper in the United States, and was established the same year that slavery was abolished in New York State. Begun by a group of free black men in New York City, the paper served to counter racist commentary published in the mainstream press. Samuel E. Cornish and John B. Russwurm served, respectively, as its senior and junior editors. 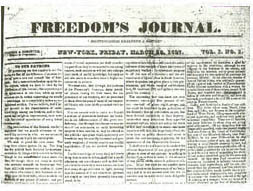 Freedom's Journal was similar to other ante-bellum reform papers in that its pages consisted of news of current events, anecdotes, and editorials and was used to address contemporary issues such as slavery and "colonization," a concept which was conceived by members of The American Colonization Society, a mostly white pro-emigration organization founded in 1816 to repatriate free black people to Africa. Initially opposed to colonization efforts, Freedom's Journal denounced slavery and advocated for black people's political rights, the right to vote, and spoke out against lynchings. Freedom's Journal provided its readers with regional, national, and international news and with news that could serve to both entertain and educate. It sought to improve conditions for the over 300,000 newly freed black men and women living in the North. 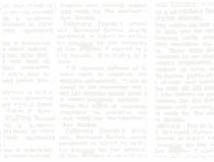 The newspaper broadened readers' knowledge of the world by featuring articles on such countries as Haiti and Sierra Leone. As a paper of record, Freedom's Journal published birth, death and wedding announcements. To encourage black achievement it featured biographies of renowned black figures such as Paul Cuffee, a black Bostonian who owned a trading ship staffed by free black people, Touissant L'Ouverture and poet Phyllis Wheatley. The paper also printed school, job and housing listings. At various times the newspaper employed between 14 to 44 agents to collect and renew subscriptions, which cost $3 per year. One of its agents, David Walker from Boston, eventually became the writer of "David Walker's Appeal," which called for slaves to rebel against their masters. Freedom's Journal was soon circulated in 11 states, the District of Columbia, Haiti, Europe, and Canada. A typical advertisement cost between 25 to 75 cents. Russwurm became sole editor of Freedom's Journal following the resignation of Cornish in September 1827, and began to promote the colonization movement. The majority of the newspaper's readers did not support the paper's radical shift in support of colonization, and in March 1829, Freedom's Journal ceased publication. Soon after, Russwurm emigrated to the American Colonization Society of Liberia, and became governor of the Maryland Colony. Cornish returned and attempted to revive the newspaper in May 1829 under the new name "The Rights of All," but the paper folded after less than a year. Freedom's Journal's two-year existence, however, helped spawn other papers. By the start of the Civil War over 40 black-owned and operated papers had been established throughout the United States. Dann, Martin. The Black Press, 1827-1890: The Quest for National Identity. New York: G.P. Putnam Sons, 1971. Penn, I. Garland. The Afro-American Press and its Editors. Salem, New Hampshire: Ayer Company, Publishers, Inc., 1891. Jacobs, Donald. David Walker: Boston Race Leader, 1825-1830. Essex Institute Historical Collections 1971 107 (1): 94-107.